IN THE 1970s the junk-bond market was a dark underworld. It was the home of “fallen angels”, the bonds of investment-grade firms that had gone to seed. Most investors were too genteel to hold them. So they traded at hefty discounts to face value. Then Michael Milken, a junk-bond guru, came along with a new gospel. A portfolio of high-yield junk was a better bet than one of supposedly safer bonds. After all, an A-rated bond can only go in one direction—down. The corporate-bond class system is still in place. Many types of mutual fund are barred from holding non-investment grade (ie, junk) bonds. But junk is no longer a stunted and shameful offspring. The high-yield market in America is now worth $1.2trn. And investment-grade bonds have also come down in the world. Around half are rated BBB, a notch above junk. Issuers are slumming it for a reason. A low rating is the price they pay for loading up on cheap debt. A world with less snobbery of any kind is a better one. But something has been lost. Mr Milken’s early disciples found value in lower classes of bonds precisely because a lot of investors shunned them. Now there is no taboo on holding (or issuing) junk or the junkier sort of investment-grade paper. Therein lies a paradox. When investors get too comfortable with corporate bonds, they may no longer be an asset worth holding. That level of comfort varies with the business cycle. The best returns are made in the early stages. The default rate is still high. Selling by panicky investors has driven bond prices down, and pushed up yields. Then, as the signs of economic recovery become clear, bond prices rally. As recovery takes hold the “spread”—the extra yield over risk-free Treasury bonds—narrows further. It is in the latter stages of the cycle, when confidence returns, that things become more hazardous. Lots of bonds are issued to finance projects that will look questionable with hindsight. Tighter monetary policy, a feature of late-cycle economies, pushes up yields. Eventually, the economy is squeezed. This is perilous for firms with heavy debts, which rely on steady profits to pay the interest. Spreads start to widen. Default rates creep up, then surge. And bond prices plummet. Where the present cycle differs is in the scale of bond issuance. Relative to America’s GDP, the debt of companies now exceeds its previous peak of 2009. Capital markets have more than filled the gap left by slower bank lending. The stock of outstanding bonds has doubled. The share of triple-B bonds has steadily increased. The proceeds have often been used to buy a firm’s own shares. A further twist has been the surge in so-called leveraged loans, which are packaged by banks and sold to private investors. Their appeal is that they are secured and have floating rates, so they do not lose value as interest rates rise in the way that fixed-rate bonds do. The downside is they feature in the sort of risky buy-out deals that have come to exemplify late-cycle exuberance, says David Riley of BlueBay Asset Management. When trouble strikes the economy, corporate leverage is likely to make it worse. 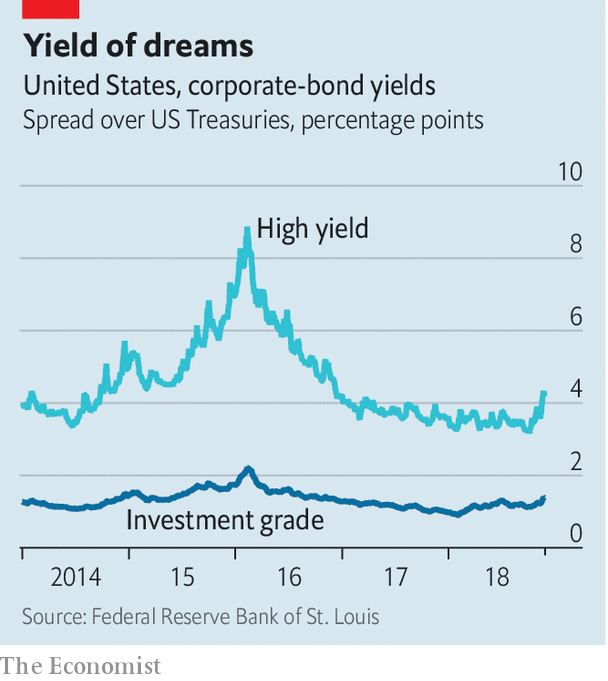 Corporate-bond spreads are closely watched for early signs that a recession is brewing. Junk spreads have widened in recent weeks (see chart). That in part is because of lower oil prices. Exploration firms are a big chunk of high-yield bonds outstanding, which is why spreads blew out in 2016, when the price of a barrel of crude fell below $30. But it also reflects nervousness about the economy. The $3trn or so of corporate bonds that lie just above the junk-bond threshold pose a particular threat. “In any recession, a portion of those bond-ratings are at risk,” says Stefan Isaacs of M&G, a fund-management group. Bond funds on either side of the divide have some flexibility in precisely when they sell or buy, he says. It is an opportunity from which old-school junkyard scavengers can make a killing. Still, there may not be enough buyers of junk to snap up such newly fallen angels without prices falling steeply. If a lot of bonds have to change hands quickly, things could easily get messy. In that event, much of the financial engineering of the past few years will come to look too clever by half. Even so, the secular decline in bond ratings will not always seem like something to regret. The A-rated world will not return. A bigger corporate-bond market is a source of opportunity—for good as well as ill. Losses will be taken. Balance-sheets will be cleaned up. And bonds will eventually rally. Then the cycle can begin again.